We started the weaning journey with Arlo around the time he turned six months, and have been doing it the ‘baby led weaning‘ way. 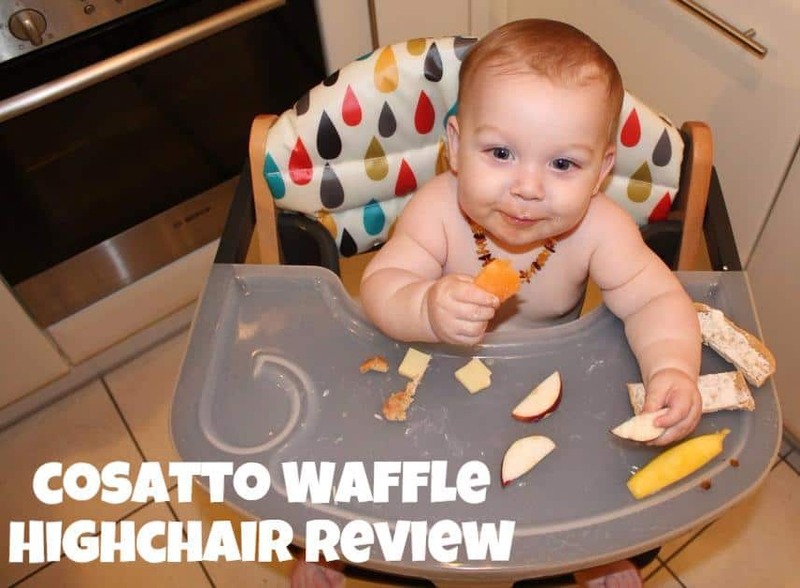 To make Arlo’s introduction to food as fun as possible those lovely people at Cosatto sent us the incredibly funky Waffle Highchair in Pitter Patter pattern! What is it: A chair to take you from baby to teenagerdom, it will fit a child of around age 12 with no problem! It’s mostly wooden frame has a height adjustable seat and footrest, so it will really grow with Arlo, in fact I’ve already had to move the seat down a level as his thighs are so chunky! The removable plastic tray covers the built in wooden tray but means for those relaly messy early months you can just remove the tray, clean it and fix it back on. It also solves the dilemma of what to clean first: baby or tray. It has a padded seat and chair back cover included, no need to pay extra. The safety hardness is included too, obviously! The safety harness and seat covers are washable. Ever given a baby spaghetti bolognese? enough said. Because it has no nooks and crannies it is really easy to clean after a meal, I brush the chair and footrest debris into a dustpan, remove the tray and wash that in the sink and job done! 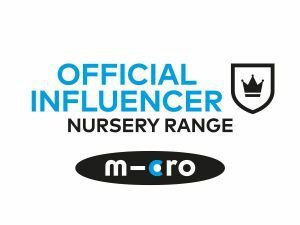 It will last us for years yet, as you can remove the tray part to make it into a ‘big boy’ seat so that when Arlo reaches toddler stage he can sit up at the table with us without the need for a booster seat on a regular chair.The tray also flips up and over in regular use. As with all Cosatto products it has a four year warranty, and you can buy spare parts when needed. I think I’ll get a set of seat covers in one of the other funky designs to have as a spare, I’ve seen the S/S16 styles and they are ACE! Rather upsettingly I have lost all the pictures of Arlos first meal (and subsequent ones taken with the ‘big camera’ in the great laptop death of November 2015, but I have been uploading photos to instagram every now and then! For its maiden voyage we went with raspberries… and the Waffle came out unscathed though Arlo clearly needed a long soak in the tub! Since then it has endured endless amounts of toast, many cucumber sticks, some ravioli and more! It has also managed to repel a lot of water as my little bean just can’t work out how to use a breaker so mostly tips his water all over himself, or drops the beaker spout down next to him. Not a lot really, unless COsatto can make a highchair that magics dropped food back onto the tray so I don’t have to pick ut all ip! But seriously it’s actually a very clevery designed chair, my one bugbear is that there is a small chip of paint missing from the arm of the tray which I think is where I have taken the plastic part off too roughly but its hardly noticeable and I will be more careful now I know it could happen. I saw their new range at Cosatto last week and these are beautiful. I think this style would be the one for us too! It’s a really simple design but a classic one I think! Would fit in with any decor! The fold flat option is a lifesaver! We had a great Cosatto 3sixti but it was massive! Looks a great seat, love the idea of it being fold flat. What adorable pictures! Ooooo it looks lovely. I went seeing the new collection and it is gorgeous. What a versatile highchair.